Radius8 expands its cloud platform enabling a direct connection between brick-and-mortar stores and Facebook’s ad platform to boost in-store foot traffic. Princeton-NJ-based retail tech startup, Radius8 announced today the addition of new tools that will allow retailers to drive foot traffic directly to their stores from Facebook’s social media platform, proving online ads can lead to offline sales. The new suite of tools called R8 Social, empowers retailers to take advantage of Facebook’s local advertising features by forging a direct connection between brick-and-mortar stores and the Facebook ad platform, giving these retailers an unprecedented ability to respond to local market dynamics. Sponsored Facebook posts generated through the R8 Social platform allow customers to view and reserve curated items that are actually in-stock and available for pick-up in their local store. Retailers can now track store visits and sales attributed to the curated Facebook ad all the while providing exponentially greater exposure to what’s available in their local stores. “Facebook having local advertising capabilities only goes so far. Retailers still need a mechanism to organize and share local store assortment,” said Sandeep Bhanote, Radius8 co-founder and CEO, making the announcement at Shop.org Retail’s Digital Summit 2016, a leading industry conference. Radius8 serves as a central point of orchestration for retailers, facilitating the delivery of store specific inventory feeds along with local trends and analytics to Facebook thereby creating a highly curated and data driven shopping experience customized for each store. “The ability of retailers to leverage data they already have combined with local analytics and trends powered by the R8 platform, gives brick-and-mortar stores local context on Facebook. It’s like giving these retailers a ‘digital lasso’ to capture and entice new customers, driving much needed foot traffic into the store.” said Bhanote. Retailers deploying the Facebook solution will be able to tap into Radius8’s cloud-based local analytics and intelligence to drive greater relevance to the consumer shopping experience, a move that CEO Bhanote predicts will drive greater online to offline conversion. 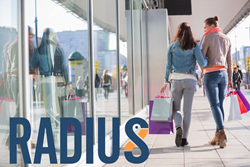 Radius8 is the only retail cloud platform that revolutionizes the way consumers interact with local retail stores. By enabling “Brick and Mortar" stores to digitally broadcast inventory at a hyper-local level, the R8 Platform drives on-demand foot traffic into stores that need the traffic the most while generating high-value Online-to- Offline (O2O) conversions. Headquartered in Princeton NJ, Radius8 was founded in early 2016 by a team of retail technology experts with the goal of transforming the role of the store in today’s tumultuous retail landscape. Radius8 is funded by Brooklyn Bridge Ventures with participation by Commerce Ventures, Newark Venture Partners Tigerlabs, and ARC Angel Fund.